Precise control is the key to your success! Control wristbands are the best way to control access and identify your authorized guests. Control wristbands can be used instead of tickets as a pass out system for crowd control, for V.I.P. guests, for different clubs, parties and celebrations which require visual identification. Control wristband can not be lost( how it can happens with the ticket) because it is tamper proof, tamper evident, non-transferable, it can not be used twice what means that you can control precisely the number of visitors. 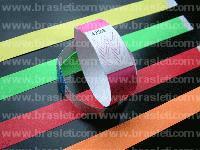 Control wristband is an excellent colorful and fashionable ticket and invisible ink hand stamping alternative. It is easily worn on a wrist and leaves no consequences on your body and clothes. Also control wristband can play a function of an advertising information media. It can be printed on any logo, graphic picture or text. Great and colorful palette allows you to choose the best color that fits theme of your celebration, interior design of your institution; you have ability to divide the audience into groups (V.I.P., team A, team B, etc.) if you need. Night clubs and bars, concerts, festivals, exhibitions, museums, schools, children’s camps, water parks and swimming pools, hotels, motels, resorts, fairs, sports events, medical institutions, religious organizations, recreation parks, casinos, animal identification, special events and corporate events. Control of enter and exit during events; you do not need to put the seal on hands of your visitors; you solve the problem of your guests and strangers at the party; the right to be a guest of the party can not be transferred; numbered wristbands can take a part in a lotteries; you have ability to place an advert or logo of sponsors on a bracelet; inability to lose the bracelet, as often happens with the ticket, saving time (employees with no extra effort can see the bracelets, there is no need to re-check the ticket).Using our wristbands in your business you can significantly increase the level of service and pleasure of staying at your event. Your visitors will think that you consummate professional and this will make excellent reputation. You will be pleasantly surprised by our prices as they are most competitive in world market. We are always happy to consider the option of cooperation. Control wristbands are beautiful, fashionable, safe and effective to use!